Dental Inlays and Onlays - Dentist in Hampshire, Ringwood. For an inlay to be successful, it is best if the cavity involves only the occlusal surface (chewing surface) and one proximal surface (surface inbetween the teeth). 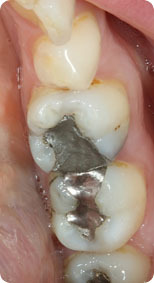 The other proximal surface should be free of decay. An onlay, which is similar to an inlay, covers the entire proximal surface and protects the cusps from fracture. Treatment involves isolation of the tooth and removal of the old fillings under local anesthesia. 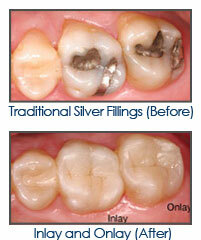 Once your dentist makes an impression, the inlay/onlay is created from porcelain, gold or composite resin material. The inlay/onlay is then cemented securely into place. 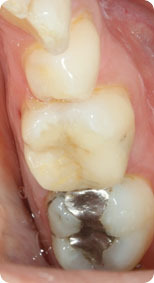 Inlays and onlays usually take 2 appointments to complete. 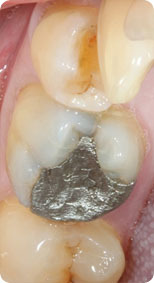 The onlay is the best alternative for covering larger surface restorations. 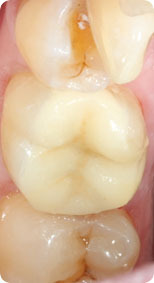 An inlay/onlay looks exactly like the rest of the tooth, and is so durable that it doesn't need to be replaced for years.